If you plan to hold any kind of group outing or event that requires transporting people from one place to another, you may debate with yourself over how to logistically move all those people. Sure, they might all have their own cars, but that might defeat the purpose of keeping the group together. If you’re asking yourself when you should hire a charter service, read on for some tips from our charter bus service in San Francisco on how to know that you’re making the right choice. 1. You’re going a long distance. Let’s say you’re planning a corporate outing from San Francisco to Las Vegas. Maybe your sales team hit a record and this was their prize. Or maybe you have been planning a youth outing to LA and you need a safe, secure way to give all of them rides. Whatever the case, when you’re going more than about 50 miles, you will begin to reap the economies of scale that come with taking a larger vehicle. If everyone drives separately, or even if some of them carpool with each other, they’ll all be wasting gas and putting wear and tear on their vehicles. Hiring a charter service saves everyone from that expense, and you can often even split the cost of the charter and get everyone to contribute their share. 2. The people in your group are unfamiliar with the destination. There’s nothing worse than showing up to the intended location, only to realize that half your group didn’t make it because they got lost on the way there. With the advent of GPS units and Google Maps on everyone’s smartphones, this is somewhat less of a problem than it used to be, but it’s still an issue, especially for the people who are late adopters to these technologies. And the destination doesn’t have to be far away for your guests to be unfamiliar with how to get there. For instance, let’s say you have a wedding here in the San Francisco area, but you have a lot of out-of-town guests coming to attend, and they’re unfamiliar with driving on San Francisco streets. Their hotel is in one location, the wedding ceremony is at another, and the reception is at a third destination 30 minutes away. Your guests will be grateful beyond words that they don’t have to figure out how to navigate the city. Instead, they will simply be able to enjoy celebrating with you without the stress of figuring out driving directions, addresses, and so forth. 3. There will be alcohol involved at your gathering. If you are offering an open bar or serving alcohol at your event in some context, you’ll have to account for how to arrange for designated drivers for everyone. We’ve heard of some companies paying for the Uber ride for each of the attendees, but the price for this can rack up fast. While in some cases, individual transportation may make more sense for you and your guests, in other cases, charter service can be the most logical and cost-effective means of accomplishing the rides that everyone needs to get home. For instance, in the wedding scenario that we pictured above, if everyone is going back to the same hotel, why not just hire a charter bus to shuttle your guests back to their lodgings when the event is over? It makes a lot of sense, and Professional Charter Services is just a phone call away when you need us. 4. It’s important to keep the group together. We all know that one character, Bob, who takes his own car to the event that’s supposed to be a group outing, and suddenly, three or four people have joined Bob because his escapades are way more fun than everyone else’s. They’re over at the seafood place, laughing and having an uproarious time, while the main group is obediently attending the event but secretly envious of Bob and his companions for their fun. Or you have those few introverts who make an obligatory showing at your event for 5 minutes and then disappear. You can avoid this by simply having everyone drive together in a charter bus to the event location. Everyone arrives together, everyone does the event together, and everyone goes home together. It’s perfect. These are just a few of the times when you should consider hiring a charter bus. 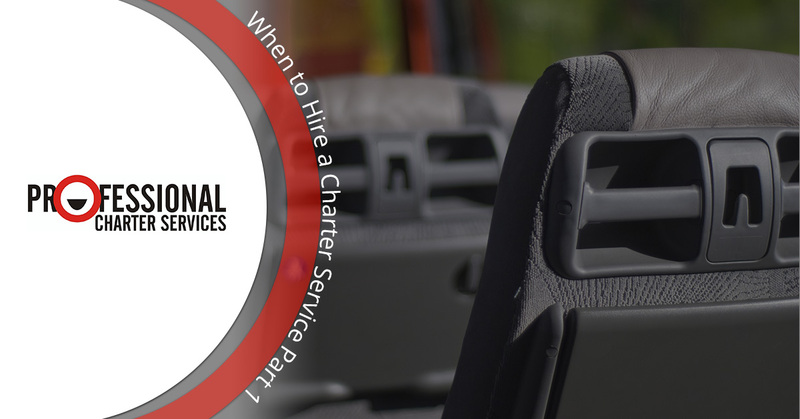 Stay tuned for our next blog, where we’ll explore more of the reasons you should hire charter service. When you need a charter bus in San Francisco, call Professional Charter Services. Get a free quote today.